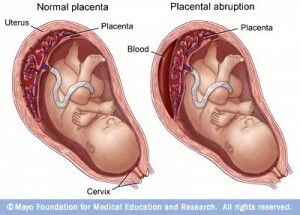 What is a placental abruption? It is the separation of the placenta (the organ that feeds the baby before it is born) from the uterus before the delivery of the baby. In most cases, the mother will notice bleeding or pain in the abdomen. Mothers should be advised to seek medical attention immediately if they experience either of these symptoms. Ideally, the placenta should remain in attached to the uterus until shortly after the baby is born, at which time it detaches and is delivered by the mother. When the placenta detaches prematurely, it can cause very serious complications for both mother and baby. For the mother, a placental abruption may result in severe bleeding (sometimes requiring blood transfusions), failure of the uterus to contract properly after delivery, and problems with blood clotting. In severe cases, a placental abruption can cause the mother to go into shock and can even cause death. For the baby, a placental abruption will result in the baby receiving less oxygen that it needs. Depending on the severity of the abruption (how much of the placenta has detached), the baby may die before birth or be born prematurely. A severe loss of oxygen prior to birth can result in brain damage, Cerebral Palsy or learning delays. Certain other health conditions and infections in the mother. If a doctor fails to diagnose and treat a condition that increases the mother’s risk of placental abruption, the doctor may be found liable for malpractice. Similarly, claims of malpractice might arise if a doctor fails to detect that the fetus is in distress due to placental abruption and take steps to deliver the baby immediately. Of course, it is not always possible for a doctor to save the baby in cases of fetal abruption. If the baby becomes distressed earlier in the pregnancy, it may be too early to deliver a viable baby. The doctor can only be expected to minimize the risk of a placental abruption occurring and to mitigate the damages if it does occur. If you have suffered a placental abruption that led to health complications for you or your baby, you may have questions about whether your situation was handled properly. An experienced medical malpractice lawyer can answer those questions.